The Outreach & Communication Award is presented to projects that explore new ways to communicate the science of meteorology, climatology and related fields and its consequences to the general public. The Award is presented in form of a trophy during the EMS Annual Meeting. Projects or candidates may be proposed by EMS Member Societies, EMS Associate Members and individual members of EMS Member Societies, individual members of the EMS Council and the Media and Communication Team, or individual members of the select committee. 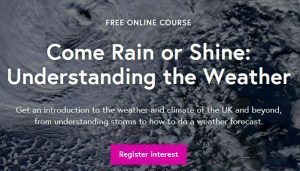 The Outreach & Communication Award 2018 was given to the Online course “Come rain or Shine” that was developed in partnership by the Royal Meteorological Society and the University of Reading, UK. The three week course focusses on the processes and phenomena which govern UK weather, and the content was developed with the needs of UK secondary geography teachers in mind, however the course was open and very much of interest to all. 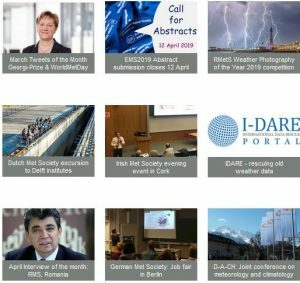 The EMS Outreach & Communication Award is given in recognition of projects that explore new and effective ways to communicate the science of meteorology, climatology and related fields to the general public. The projects may deal with the results or the consequences of science, and may also be targeted at a more specific audience. In particular, project teams will be considered for the award, but proposals of individual initiatives are also welcome. Individual members of the select committee. The documentation required for the proposal is a description of the aims of the project and a plan how these are to be achieved. An example of the realisation (a presentation, video of a presentation etc) will have to be included in the documentation and, in addition, a short description of the background of the project team (members) will be required. Please submit any proposal in electronic format to awardapplication@emetsoc.org. The Award consists of a trophy and a certificate. The Award will be presented during the EMS Annual Meeting in September 2019 in Copenhagen, Denmark. The documentation of the project will be published as an example of Best Practice on the EMS Website. The EMS Outreach & Communication Award is given annually in recognition of projects that explore new and effective ways to communicate the science of meteorology, climatology and related fields to the general public. This can include the results and consequences of the science, and can also be targeted at a more specific audience. In particular project teams will be considered for the award, however individual achievements will also be considered. There may be more than one project selected for the award in each year. A selection committee, consisting of the Chair of the EMS Media Team, a member of the Awards Committee and the Chair of the Education Team, plus at least three more experts, appointed by the EMS Council on a yearly basis, will decide on who will be the Laureate(s). The selection committee will normally work by e-mail. EMS Member Societies, EMS Associate Members and individual members of EMS Member Societies. Individual members of the EMS Council and the Media and Communication Team. Individual members of the selection committee. The Laureate(s) will receive a trophy that will be presented during the Media Session of the EMS Annual Meeting.